In the cold seas off Hokkaido, Japan's northernmost island, a brown algae known as kombu or kelp, grows in a dense underwater forest. Floating on the water in small skiffs, men and women cut the kombu free using razor-sharp knives that are attached to long bamboo poles. As the kombu floats to the surface it is gathered with wooden rakes and placed in the boats. Once back on land, the kombu is laid out to dry slowly and naturally in the sun. 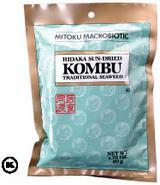 Mitoku Kombu is harvested from the cold ocean depths from the northern island of Hokkaido. The kombu is then naturally sun-dried. 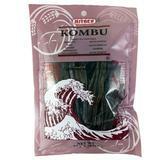 Kombu is indispensable for making a tasty cooking stock for soups, sauces and noodle broth. When cooked with beans, kombu has the unique ability to soften the beans, shorten the cooking time and make them more digestible. Dried, ground root of the esteemed Asian water lily, treasured for contributing to respiratory health, with 5% ginger root powder. A pleasant and quick way to take this renown health food. A macrobiotic staple. Boil a teaspoonful for three minutes and sip while hot. Low sodium, fat free, and gluten free. Glass jar. Eden pure, authentic, unadulterated. Mitoku Kombu Powder is made from premium quality kombu, which is harvested from the cold ocean depths off the northern island of Hokkaido. The seaweed is dried and ground to a fine powder. It contains no artificial additives or preservatives as most seaweed powders. Use Kombu Powder to impart extra flavor and wholesome goodness to miso soups, tamari broth, or grind with sesame seeds for a delicious condiment.